I chose this recipe because it looked simple. There isn’t much time to do anything fancy on Tuesday nights, so I’m always looking for something I can either only spend fifteen minutes on or that I don’t have to faff with. This fit that bill perfectly. I just couldn’t be bothered to mess around. However, I was not prepared for how incredibly GORGEOUS it is. Or how gorgeous I was able to make it just by tweaking a few things. Make this. Go and get it and make it now. It’s incredibly lush. 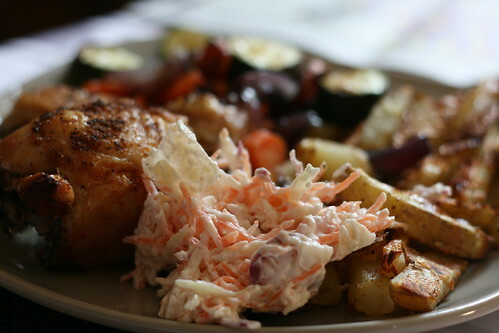 Also, I served this with my Mum’s Special Healthy Coleslaw recipe, which I’ll throw in too. The best, creamiest coleslaw you’ve ever eaten, and it’s almost entirely fat free. Lovely. Okay. Pre-heat the oven to 200C and start preparing everything. 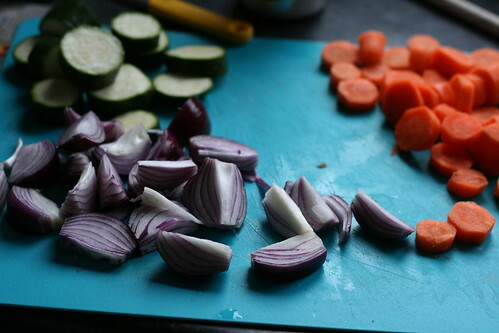 The potatoes need to be cut into wedges, the red onions need to be peeled and cut into wedges, the carrots need to be peeled and cut into chunks and the courgettes need to be cut into chunks. Cut a few slits into the chicken flesh. 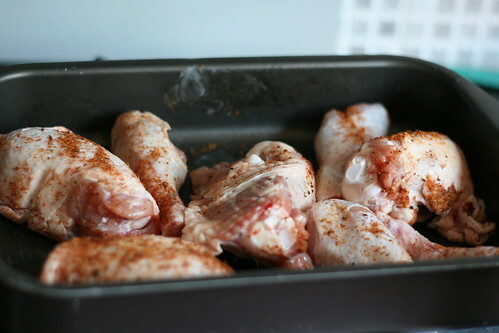 Spray a large roasting tin with Fry Light and put the chicken in the roasting tin. Spray the chicken lightly with Fry Light, sprinkle the Cajun spice over the top (However much you like, it’s good to have it fairly spicy) and toss together so the spice is evenly distributed. Then, put the chicken in the oven for 50 minutes. Put the potatoes in a saucepan of boiling water and boil for five minutes. Drain well, before putting them back in the saucepan and giving them a good shake to rough them up slightly. 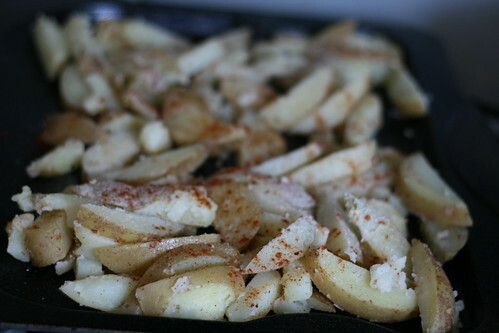 Then spray well with Fry Light, spray a baking tray with Fry Light, and put the potatoes on the tray. Then take a few teaspoons of paprika and sprinkle over the top. 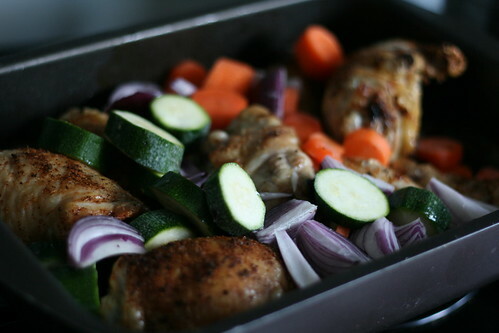 When the chicken has 25 minutes left to cook, take the it out and nestle the vegetables between the chicken pieces. Then put the chicken and the potatoes in the oven for 25 minutes. 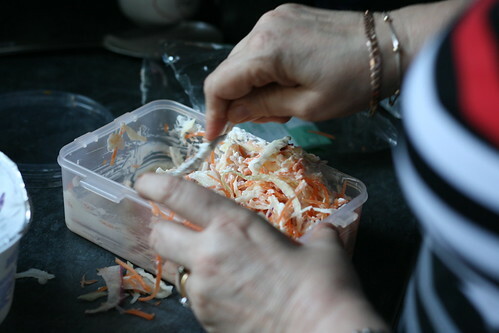 Whilst that’s finishing off, you can make my Mum’s Super Healthy Coleslaw. 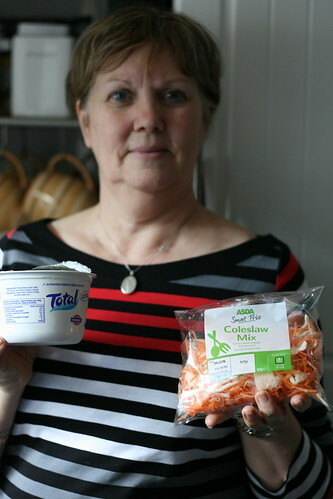 You can make coleslaw by getting white cabbage, carrots and spring onions and doing very involved draining and boiling and softening. Or, you can buy some ASDA coleslaw mix for 50p and have all the effort taken out for you. If you fancy adding some red onions, just slice them up and throw them in. And…that’s it. Just stick it on a plate with the rest of your meal. 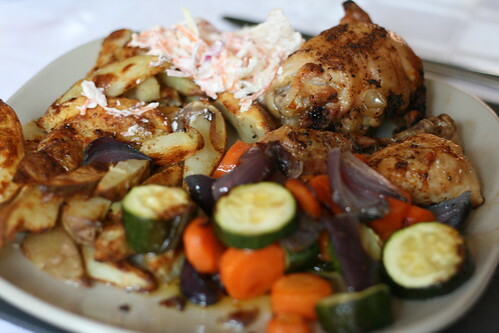 Speaking of the rest of the meal — once the chicken, vegetables and wedges are ready, just take them out and pop them on plates. This is delicious and tastes far nicer than the recipe suggests. It’s really easy to do so great if you haven’t got a lot of time to spend in the kitchen.